Super basements have become increasingly popular with wealthy Londoners. The possible uses are endless, but is there a down side to going underground? In Central London’s more prestigious residential areas, space is at a premium like nowhere else in the country. 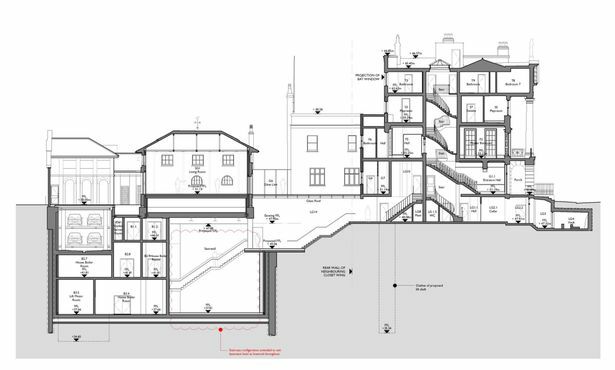 The possibilities to extend sideways or upward are extremely limited, so it is of little surprise that so many of London’s super rich have decided to extend downwards and construct super basements beneath their homes. But the controversy around these constructions has grown as quickly as the basements themselves. Planning regulations are ambiguous, and the works can take a lot of time to complete, causing noise and disruption to neighbours. In addition to this, there has been increased concern from both residents and local authorities about their potential to increase London’s existing flood risk. At a time when developers are being urged to adopt sustainable drainage methods, homeowners are potentially reducing the effectiveness of drainage channels in London. The idea of super basements originated over the Atlantic, despite the fact that as a country, the USA has more space going spare than the UK. Nevertheless, the idea of a “Bond villain” style subterranean lair captured the imagination of many Silicon Valley millionaires in the 1990s. The potential uses for the additional space created are almost endless. Some opt for the practicality of an underground car park, while others choose to add some luxury facilities to their homes. Swimming pools and huge “man caves” and cinemas are popular additions. Here in the UK, the idea quickly caught on as a practical solution to the lack of space, particularly in popular high-end residential areas like Westminster, Kensington and Camden. This has led to what are termed “iceberg homes” that can be bigger below ground than above. Perhaps the most famous of these has been Russian Oligarch Roman Abramovich’s recent application to add a 4,000 square foot leisure complex beneath his £125 million Kensington home. The project, comprising a swimming pool and steam rooms, is said to draw inspiration from Victorian underground culture, taking cues from drainage networks and underground stations. However, this is by no means the most extravagant use to which London’s billionaires have put their underground extensions. A close neighbour of Abramovich is Canadian TV mogul David Graham. He has plans for a four storey basement, comprising a ballroom, spa, pool and twelve bedrooms. And just up the road lives Britain’s richest man, Lakshmi Mittal. The basement under his Kensington Palace Gardens home is made of imported marble of the same type as used to make the Taj Mahal. It has a ballroom, a jewelled pool, a picture gallery and Turkish baths. The developments are not just restricted to domestic homes belonging to the super rich. Claridge’s hotel recently put in an application for its own “iceberg basement” that would reportedly be the size of 20 houses. The controversy surrounding basements has led to restrictions in what can be built and where. While Kensington and Chelsea have completely outlawed any further digging for this purpose, in other boroughs, residents can still build whatever they want under “permitted development rights,” provided the extension is only one storey deep. The government proposes to examine the long-term implications of further extensions of this nature. It is well-known that London’s drainage systems are already close to capacity, and these constructions can only increase flood risk. The Royal Borough of Kensington and Chelsea also expressed concerns that basements can disrupt groundwater runoff courses. Whatever the size and style of these developments, it is vital that drainage is well planned and excavation works are carried out with guidance from drainage experts. There is no doubt that underground iceberg extensions are a great way of making additional space in the capital’s most popular areas. Objective consultation on the subject and listening to the views of all stakeholders will help to ensure that developments are constructed responsibly and with consideration to future generations.